Let’s let Gabe and the other alienated children know they are worth getting to know! You are cordially invited to celebrate Gabe’s 7th birthday party with them. Landon, 8 is a second grader who has been diagnosed with autism, ODD, and ADHD. He is both bullied and alienated. No matter how many invitations are sent out for birthdays or events, nobody shows up or calls. Peyton will be 9 this March. A super sweet child with ADHD he is bullied horribly at school, and the school says they are “working on it” to try to end it. In the meantime, Peyton is both bullied and alienated and would just love a friend to play with. Matt, 12, is high functioning and has been through so much medically with 2 brain surgeries and a spinal surgery. He has epilepsy and also needs to wear leg braces. He would love to have a friend but nobody ever invites him over to come and play. James, 14, has ASD and has not been invited to a party or any social event since he started middle school in spite of numerous attempts to invite others. This has led to school anxiety and not just sadness but depression. Gabe Manus just wanted a birthday party, with friends. After several years when no one even RSVPed yes or no to his parties, he was ready to give up. Saturday, March 10th will change all that as the community comes together to celebrate him and all those individuals and families out there feeling the same alienation. You are cordially invited to attend Gabe’s party. Gabe is a loving, friendly child with autism who loves to be around people. However, he struggles in social situations, is ignored or left out by his peers and is often made fun of for being different. His birthday party excitement vanished last year when not a single school “friend” RSVPed to his “race car” themed birthday party last year. This year’s theme, with the help of crowdFunnit, and the community, will be a Carnival Fantasy party, with games and fun, where attendees are encouraged to dress up as their favorite character (cowboy, princess) in the comfort of a loving community. Stephanie Manus reached out to the 501(c)3 nonprofit Cherab Foundation through their initiative crowdFunnit, with a simple request that her soon-to-be 7-year-old son with autism know there is a world out there that doesn’t hate him. crowdFunnit is dedicated to improving the lives of those who are bullied and alienated, fostering acceptance, compassion, and friendship through open-invite birthday parties. crowdFunnit and the Manus family welcome other families in the same situation to share their stories and come be a guest of honor at the party; If you are in this situation contact us friends@crowdfunnit.org Equally important is the presence of compassionate individuals and families of all ages to come out and join the fun, share some cake and make a few new friends. Early word of the party touched Rocky Mount Sergeant Joshua Mason of the K9 Patrol Division so much that he and his trusted buddy, a Shepard/Mali mix named Spike, have offered to stop by for a visit. He will also be demonstrating to the children how Spike does his work. As a combat veteran, Sergeant Mason knows the wonderful potential of therapeutic animals. “It really means a lot to me to see the joy my dog brings to people so I love to do it,” he said. FIVEFOURlow, a local charity car club who does a lot of work for autism awareness heard about the Cherab Foundation crowdFunnit event to support Gabe and the other children being bullied and alienated through news coverage and was moved by it. They will be showing up with real life “HotWheels” as well as some actual HotWheels for the children. According to Lisa Geng, creator of crowdFunnit and President of the Cherab Foundation, “Children with communication impairments have a higher risk of socialization issues. The Cherab Foundation initiative crowdFunnit proactively raises awareness about inclusion, anti-bullying, and even friendship through crowd-sourced events. There is no admission cost to attend the party, however, we are looking to raise $500 towards basic party supplies, gifts for Gabe and the other children who are bullied or alienated, and to contribute to the 501(c)3 Cherab Foundation which is both the organization behind crowdFunnit and also provides evidence-based and integrative approaches to help our special children with therapy, nutrition, awareness and in socialization, especially those that are at-risk in the United States, as well as in developing countries. Every dollar helps and any money over our goal can help others in need of support. Please contribute here. crowdFunnit Crowd-Sources Special Events For Special Kids: crowdFunnit, a project of the 501(c)3 nonprofit Cherab Foundation, was created to brings people together, raising awareness about differences while fostering acceptance and compassion. Helping a friendless child celebrate a birthday is just an incredible mechanism in which to help make this happen. The party itself and any media attention it brings will help fight bullying at the root while the community connections will exist long after the party ends. I would like to RSVP for my daughter, Tabitha. She has ADHD and many kids in her grade and above do not understand her issues. We’re excited to meet you! When you have a sec, can you please RSVP on our Facebook event page? K9 Spike and Officer Josh Mason will be present to enjoy the day with Gabe! We’re so excited to meet you and Spike!! I would like to RSVP for my wife and I. We would be honored to wish Gabe a happy birthday! I am a local children’s book author and would be happy to include a link to your party on our Facebook page if you are ok with it? We look forward to meeting Gabe! I’m sure all the families would love to have you there as a local children’s book author! Yes please share Gabe’s event page https://www.facebook.com/events/1689751211067827/ or any other links on your Facebook page. We’d so appreciate it. Let us know the link so we can share your page too! Thank you so much -looking forward to seeing you Saturday! 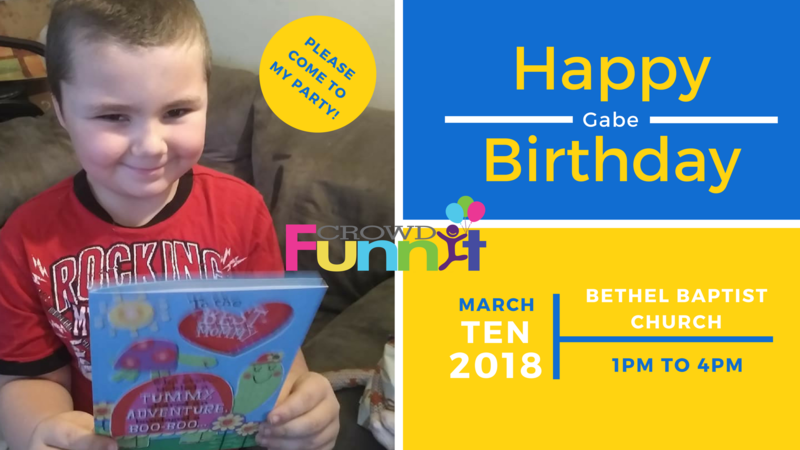 We would like to RSVP for Gabe’s party! We will be bringing 2 children and 2 adults. My son who is also 7 came home from school today and told me about this wonderful event. We would love to meet Gabe and wish him the best birthday ever!